With its pioneering history and forward-thinking approach, the Sleep Medicine Fellowship at Hennepin Healthcare trains the next generation of sleep specialists in all aspects of sleep-wake and circadian disorders, including sleep neuroscience, parasomnias, hypersomnias, sleep-related movement disorders, and sleep-disordered breathing in cardiovascular and pulmonary disease settings. 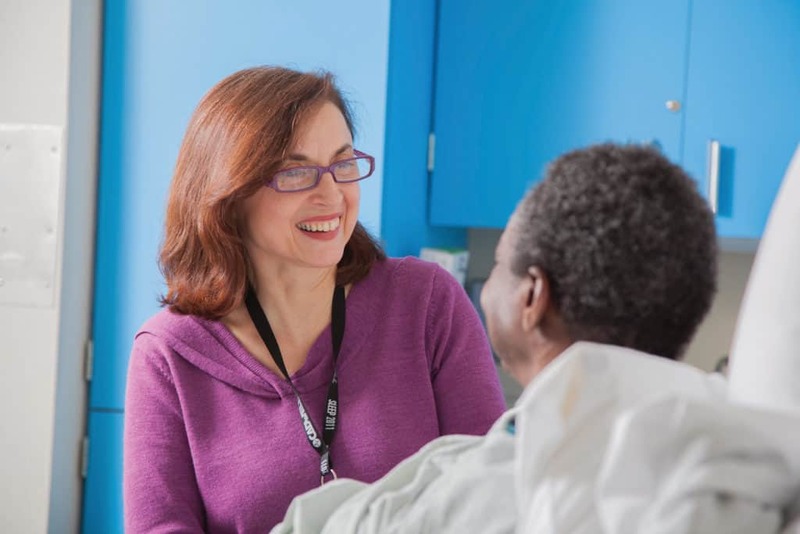 Our dual-site program delivers a wide spectrum of patient diversity and clinical experience. Fellows rotate at dedicated sleep clinics within two of the region’s largest academic training hospitals, Hennepin Healthcare and the University of Minnesota-Fairview. Fellows work side-by-side with staff who are leaders in the field and passionate about teaching. Together, we are actively re-envisioning how we can innovate care delivery in sleep medicine. Our program was founded in 1977 and ACGME-accredited in 2005. The Sleep Medicine curriculum provides a comprehensive education in clinical sleep medicine for adults and children, with emphasis on sleep neuroscience. As an academic healthcare system, we maintain a well-earned reputation for our collegial atmosphere and supportive environment that fosters learning and discovery. Our forward-thinking approach emphasizes multidisciplinary collaboration, hands-on clinical skills, and the latest technology, all to deliver exceptional patient care. We collaborate with the University of Minnesota’s Center for Magnetic Resonance Research to access the latest imaging technology for sleep medicine research. Fellows evaluate, monitor, and treat sleep disorders with cutting-edge equipment, including remote access to polysomnograms, and new home polysomnographic recording and interpretive equipment. Both sites incorporate the EPIC electronic medical records system. We enthusiastically support scholarly activities and research pursuits of our fellows. The Minnesota Regional Sleep Disorders Center has a long history of discovery and innovation and participates in a number of ongoing clinical trials. We are actively investigating REM sleep behavior disorder and its relationship to Parkinson’s disease, as well as other parasomnias. Fellows can build their knowledge with several required and optional conferences each week. Topics range from new research and challenging cases to practical skills required to manage a sleep clinic. Specialists from Hennepin Healthcare and the University of Minnesota-Fairview attend and present. Eleven core faculty lead the Sleep Medicine Fellowship, each holding staff positions at Hennepin Healthcare or the University of Minnesota-Fairview. In addition to clinical practice, research, and teaching in the Twin Cities, our faculty are nationally recognized for their work and activities within the field of sleep medicine. Dr. Con Iber is past president of the American Academy of Sleep Medicine and recipient of the Nathaniel Kleitman Distinguished Service Award. Dr. Michael Howell is a founding board member of the Minnesota Sleep Society. Dr. Carlos Schenck is past president of the International REM Sleep Behavior Disorder Study Group and recipient of the William Dement Award. Program Director Dr. Muna Irfan is highly dedicated to education and furthering the field of sleep medicine. She is the recipient of the Young Investigator Research Award and is a member of the executive committee of the American Neurology, Sleep Section and other educational platforms. Past faculty include Dr. Mark Mahowald, who discovered REM sleep behavior disorder, received the William Dement Award, and was past president of the American Academy of Sleep Medicine. Every day our faculty share their dedication and expertise in a variety of key disciplines. Residents rotate in six-month blocks at two of the leading sleep medicine centers in the Twin Cities. Fellows work with experienced faculty at each location. All rotations comply with duty hours. Hennepin Healthcare researchers were first to recognize several common sleep disorders, including REM sleep behavior disorder and its link to Parkinson’s disease, and sleep-related eating disorder and its relationship to restless leg syndrome. The sleep center draws national and international referrals for complicated conditions and rare disorders. Fellows gain hands-on experience evaluating and treating patients with severe conditions. Fellows care for patients from across the spectrum of ethnic and economic backgrounds, with healthcare needs at all levels of severity. Rotations at the University of Minnesota include patients from across a large hospital network. Both sites feature comprehensive pediatric experience. More than 100 physicians have received advanced sleep medicine training at Hennepin Healthcare since our program was founded in 1977. Our alumni hold clinical and research positions around the world. Since 2005, 100% of our graduates who have taken sleep medicine board exams have passed. We are interested in a diverse group of medical specialties, which include but are not limited to internal/family medicine, neurology, psychiatry, pulmonary/critical care, cardiology, otolaryngology, and pediatrics. Non-resident applicants are welcome to apply. Hennepin Healthcare sponsors the J1 visa only. Submission: Submit your application through the Electronic Resident Application System (ERAS). Contact your medical school’s student affairs or dean’s office for instructions. We do not accept applications through the mail. Hennepin Healthcare participates in the National Resident Matching Program (NRMP). Scoring: Our program does not require a minimum score. We are looking for unique individuals with diverse backgrounds who have demonstrated an interest in sleep medicine, a commitment to excellence in patient care, and a naturally collaborative personality. Interviews: Selected applicants will be invited for interviews. We hold interviews August 1 through early October. Fellows rotate in six-month blocks at dedicated sleep medicine clinics within Hennepin Healthcare and the University of Minnesota.